A riddle: What do you get if you add $209 billion to $54 billion to $15 billion? If you answered "a lot," you're correct and not particularly inclined toward math. If you answered $278 billion, you're adept at arithmetic and correct, if literal-minded. If you answered the respective unfunded liabilities for Illinois' state-run pension funds, its retiree health-care system, and its pension bonds, you're correct and probably cheating. And if you answered "a time bomb," you're probably most correct. Because while the numbers are important, they're constantly changing and open to interpretation, and the most important aspect of them is their magnitude. Whether it's cast as an $83-billion pension problem or a $278-billion benefits issue, the sheer size of it shows that it can't be solved with tinkering. "We're getting close to the point where the choice is between making pension payments or paying for goods and services that we need today," said Rae Ann McNeilly, director of outreach for Taxpayers United of America. "We are coming to the pinnacle of financial crisis where something has to be done." Ted Dabrowski, vice president for policy for the Illinois Policy Institute, said retiree health care is another unfunded liability that will soon reach a critical juncture for Illinois government: "We've promised all these things, but we haven't set aside any money. ... The only way to pay them is to take money from the current budget. And the way it's growing, that means you're going to take away from education, from health care, from public safety ... ."
If that rhetoric sounds overheated, consider the 2010 paper "Are State Public Pensions Sustainable?" by Joshua D. Rauh of Northwestern University's Kellogg School of Management. He concluded that using the typical state asset-growth forecast of 8 percent a year, the money in the pension funds for "Illinois would run out in 2018, followed by Connecticut, New Jersey, and Indiana in 2019." Only "five states never run out" in this scenario. Iowa would run out of pension-fund cash in 2035. A June analysis by the Pew Center on the States outlined a problem that has grown dramatically in the past decade: "Many experts say that a healthy pension system should be at least 80-percent funded. In 2000, more than half of the states were 100-percent funded, but by 2010 only Wisconsin was fully funded, and 34 were below the 80-percent threshold - up from 31 in 2009 and just 22 in 2008." The funding ratio for the Iowa Public Employees' Retirement System, for example, dropped from 97.2 percent in 2000 to 81.4 percent in 2010. Pew calculated that Illinois in 2010 had a $76-billion unfunded liability (out of a $138.8-billion total liability) in its pension funds, and a nearly $44-billion unfunded liability for retiree health care - meaning a total unfunded liability for retiree benefits of $120 billion. Iowa in 2010 had a $5-billion unfunded liability (out of a $27.1-billion total liability) in its pension funds, and a $538-million unfunded liability for retiree health care - for a total unfunded liability of close to $6 billion. Those are big numbers, but they don't tell the whole story. The unfunded liabilities represent, at a given point in time, how much additional money the states would need now to pay for retiree benefits already earned. Add current assets to the unfunded liability and you get the total liability - the amount of money today that should through investment be adequate to fully fund retiree benefits. But that calculation is premised on a certain return on investment; if actual earnings are below expectations, the total and unfunded liabilities grow. Most states estimate their unfunded liabilities based on an anticipated asset-growth rate of roughly 8 percent a year - a historical number that many experts consider optimistic today, meaning that the actual retiree-benefit situation might be even more grim. Rauh's paper figures that with 8-percent return, "states in aggregate will run out of funds in 2028." However, "if average returns are only 6 percent, state funds in aggregate will run out in 2024." The Illinois Policy Institute notes that Illinois' five pension funds assume a rate of return of between 7 and 8.5 percent a year in calculating unfunded liability. But their five-year average returns have ranged from 3.1 to 6.3 percent, and their 10-year average returns have been between 4.5 and 6.1 percent. The institute calculated that the state pension system's unfunded liability is actually $209.0 billion under new, more-realistic reporting requirements by Moody's - instead of the current official estimate of $82.9 billion. Pew said that one analysis of similar Governmental Accounting Standards Board reporting requirements and state and local pension systems found that "if the new rules had been in effect in 2010, those plans' funding levels would have dropped from 77-percent funded to 53-percent." The first thing to understand about the pension crisis is that states nearly universally give their workers defined-benefit pensions. In these plans, workers are promised a certain retirement income based on their salary and years of service, regardless of how much they or their employers contribute to the system, and regardless of how much money those contributions generate through investment. Employer-provided defined-benefit plans in the United States originated, according to the federal Bureau of Labor Statistics, with the American Express Company in 1875 and spread to the railroad, banking, and public-utility sectors. As of March 2011, 84 percent of local- and state-government employees had access to a defined-benefit retirement plan, according to the Center for State & Local Government Excellence. Taxpayers of course foot the bill for the required employer contribution, but they also end up paying for an additional portion of pensions under a variety of scenarios: if the initial contributions aren't adequate, if the investments don't perform up to expectations, if people live longer, and/or if contributions aren't adjusted to account for market shortfalls and increased life expectancy. 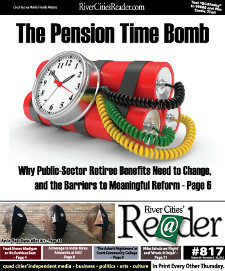 Illinois has skipped or underfunded annual pension payments, but the current pension crisis across the country illustrates forcefully that the combination of employee and employer contributions and investment return is grossly inadequate to cover states' pension obligations; simply put, what public-sector employees will draw from pension systems is far greater than the sum of contributions and earnings. As of Fiscal Year 2010, taxpayers nationwide are holding a $757-billion bill for anticipated shortfalls in state retirement systems, the Pew Analysis shows. That unfunded liability has spurred discussion of both a federal bailout of state pension systems and federal legislation to allow states to declare bankruptcy. The unfunded-liability problem extends to other retirement benefits, particularly health care: Inadequate money has been set aside to cover the costs of things promised to public-sector workers. The states' estimated unfunded liability for retiree health care, according to Pew, was $627 billion in 2010. Two recessions in the U.S. economy since 2000 have certainly exacerbated the situation by bringing down returns on investments. They've also put budget pressure on state and local governments, and because pensions and other retirement benefits are long-term obligations, funding for them has suffered in favor of short-term priorities. 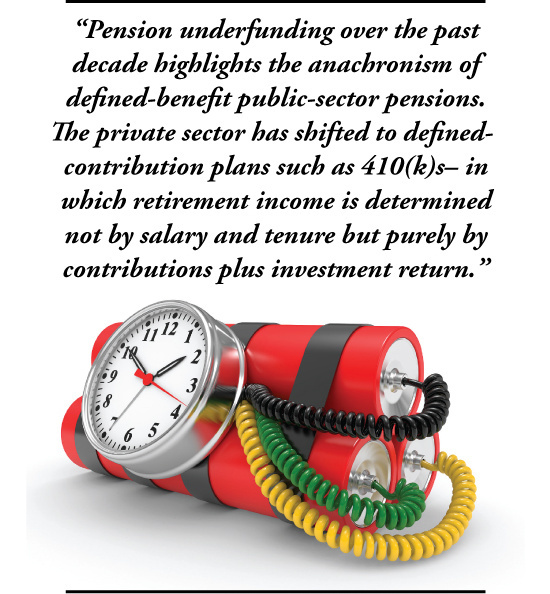 Yet in a larger sense, pension underfunding over the past decade highlights the anachronism of defined-benefit public-sector pensions. The private sector has shifted to defined-contribution plans such as 410(k)s- in which retirement income is determined not by salary and tenure but purely by contributions plus investment return. Defined-contribution plans are attractive to employers and (with public-sector employees) taxpayers because there is, by nature, no unfunded liability. As Businessweek noted last year: "In 1985, a total of 89 of the Fortune 100 companies offered their new hires a traditional defined-benefit pension plan, and just 10 of them offered only a defined-contribution plan. Today, only 13 of the Fortune 100 companies offer a traditional defined-benefit plan, and 70 offer only a defined-contribution plan." The public sector is now learning what the private sector learned over the past three decades: that defined-benefit programs are tremendously expensive in the long run if not properly funded up-front. And even when enough money is put in at the outset, uncertainty is built in. As McNeilly of Taxpayers United of America said: "They are mathematically impossible to sustain. The whole system is predicated on the future growth of the current asset investment. That's an unknown, and we treat it as a known when we're calculating the value of the asset." A defined-benefit system "puts the taxpayers at risk of catastrophic unfunded liabilities." Somebody will need to pay for those benefits, or the benefits will need to change, or both. As Pew summarized: "Though states have enough cash to cover retiree benefits in the short term, many of them - even with strong market returns - will not be able to keep up in the long term without some combination of higher contributions from taxpayers and employees, deep benefit cuts, and, in some cases, changes in how retirement plans are structured and benefits are distributed." McNeilly emphasized that the pension issue is "a matter of mathematics. The math doesn't work. It's pure arithmetic. So there's no ideology here; the system doesn't work and it's been proven not to work." She also said that beyond a core lack of sustainability, Illinois' pension system is rife with abuse - double-dipping and "spiking" pensions through overtime and higher end-of-career salaries. She said that 6,700 current Illinois pensioners take home more than $100,000 annually, and her organization estimates that number could be 25,000 by 2020. Taxpayers United advocates shifting employees to a defined-contribution system. "Any reforms that we can make for current employees need to be made," McNeilly said. "As far as new hires, they really need to be out of the pension system altogether and into a defined-contribution plan." She acknowledged, however, that pension reform has "become a left/right issue - another divisive issue." There's certainly some anti-union sentiment at work here. When asked why states haven't shifted more quickly to defined-contribution plans for new employees, McNeilly answered: "Votes. The unions deliver a ton of votes to people who vote for the defined-benefit system. ... It's a game; it's a ploy." She further argued that maintaining the current retirement system is the primary reason public-sector unions exist today: "Without the pension benefits, there really is no need for union leadership. That's the biggest negotiating point - pensions. Health care, too; that's a whole other unfunded liability." She stressed that Taxpayers United does not intend to "blast rank-and-file [union] members. It's to blast the [defined-benefit] system that's sold to them as a good thing." Nonetheless, efforts to reform state pension systems are often seen as de-facto attacks on union workers. Defined-benefit pensions and retiree health care were negotiated, and any changes that make those systems more sustainable will inevitably come at the expense of employees - through higher worker contributions, reduced benefits, or later retirement ages. So unions tend to fight structural reform efforts, and politicians allied with unions are hesitant to seriously consider them. In a June statement, a coalition of public-employee unions under the banner of We Are One Illinois bemoaned the Illinois Senate's passage of legislation that would "shift the lion's share of the burden for Illinois pension debt onto employees and retirees, who have faithfully contributed their share over their working lives." The Illinois Policy Institute's Dabrowski acknowledged that it's difficult to bring unions on board, but he said it's in their long-term interest: "Without those reforms, the pension system will go bankrupt anyway, so state workers will have to get behind some form of reform if they want to see their future benefits." Yet even if unions decide that structural pension reform benefits their workers in the long run, the existing problem doesn't go away. As Dabrowski said: "Most people will agree that benefits that are already earned and promised should not be diminished." This is actually written into the Illinois Constitution's pension clause, which states that "benefits ... shall not be diminished or impaired." The Pew Center on the States report noted that "between 2009 and 2011, 43 states enacted benefit cuts or increased employee contributions, or did both, according to the National Conference of State Legislatures. The trend continued in 2012: Alabama, Kansas, Louisiana, New York, Virginia, and Wyoming were among the states that adopted major reforms." But it added that "the reforms that states have enacted in the last three years mostly affect future state workers, as it is legally difficult to reduce benefits for current employees and retirees." At RealClearMarkets.com, Steven Malanga suggested that states cannot truly address pension debt without changing benefits for current employees. Despite retirement-benefit changes, he wrote, "pension debt keeps rising and annual payments to pension systems from government budgets are spiking in many places, in part because many of these so-called reforms are superficial in nature. ... The states left benefits untouched for the vast majority of their workforce. The savings make only a small dent in future costs." That's one reason that Rhode Island has been cited as a model for reform. The Pew report said: "In 2011, Rhode Island lawmakers approved an unprecedented overhaul of the state's traditional defined-benefit-pension plan. If the legislation survives a likely legal challenge, it will cut benefits for current as well as future employees and trim the state's unfunded liability by an estimated $3 billion. Current workers will keep the retirement benefits they have earned already, but beginning July 1, 2012, they will earn new benefits at a lower rate. These workers will also get access to a newly created individual retirement account, which will add to their benefits based on the retirement contributions by both the worker and the state. The overall plan is called a hybrid because it combines features of the traditional defined-benefit and defined-contribution plans." Still, even modest reforms can have some impact. • "The vesting period for new employees will increase from four years to seven years. • "The reduction for early retirement will increase from 3 percent to 6 percent for each year before age 65. • "The number of years used to calculate highest average salary for benefits will increase from three years to five years. • "The amount that the combined employer and employee contribution rate can be raised or lowered annually will change from 0.5 percent to 1 percent. • "There was a one-time increase of 2 percentage points (11.45 to 13.45 percent) in the total employee and employer contribution rate effective July 1, 2011. Before a contribution increase of 0.5 percent in 2008, the legislature had not changed contribution rates since 1979." • "Employees were allowed to retire before reaching normal retirement age with the old reductions; the increased penalty for early retirement applies to those years worked after the reforms take effect. "Iowa has provided an example that can be followed to ensure employees are eased through what can be an anxious process." In Illinois, Governor Pat Quinn earlier this year signed Senate Bill 1313, which will allow the Department of Central Management Services to determine what health-care premiums retirees will pay. (Roughly 90 percent of retirees in the state's plan pay no premiums.) That could shave $30 billion off the state's retiree-health-care liability, Dabrowski said. Other reform, however, has been elusive. Dabrowski said the state needs to move to defined-contribution benefits for all future work. Beyond that, he said, eliminating cost-of-living adjustments (COLAs) to pensions for a long period of time could eliminate $30 billion in unfunded liabilities from the official $83-billion estimate. "If you don't ... reduce COLAs - if you don't freeze them - then you can't get out of the hole," he said. Increasing retirement age to age 67 could save more than $10 billion, he noted. Furthermore, the state could cap pensions, and also change the number of years that go into the pension calculation. "All these reforms would chip away at the unfunded liability," he said. "The state would be left with an unfunded liability, but one that would be much more manageable, that can be chipped away over time without destroying funding for kids' classrooms, and health care, and other important needs." Dabrowski said pension reform could be passed in January's lame-duck legislative session, although he said he's skeptical the changes will be meaningful: "We think it can be done. Of course, it takes a lot of political will and a lot of leadership, which we haven't seen yet." He added that two triggers could push the legislature to truly address the issue. "We're going to see funding for education start to be cut. We're going to see funding for ... a lot of core services the state needs to be cut," he said. "At some point, people are going to get angry. ... We're nearing that point over the next few years." Alternatively, he said, the bond market could further downgrade Illinois' rating, which "would send a signal." The state isn't at that point yet, he said, but "we're doing all the wrong things to move us in that direction."